The Rio SX is the only model to offer a navigation system and leather trim. Extreme-couponing fans know the drill here: take the popularly-equipped EX, use your phone for GPS, enjoy the cloth seats and save a thousand bucks or so for future gas bills. The yardsticks have moved--but the 2012 Kia Rio has kicked itself into contention in a class filled with very good economy cars. We've seen it before, with the Optima, the Sorento, the Forte and Soul. 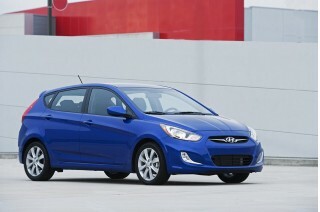 Now it's the 2012 Kia Rio's turn, and it's another major upgrade into the big leagues. The Rio is as good as the last Honda Civic we truly enjoyed driving--the pre-2006 version--and joins the Chevy Sonic, Ford Fiesta and Hyundai Accent as one of the new benchmarks in the subcompact class, with looks, features and efficiency as its most convincing bullet points. European designers draw European-looking cars, and that's true with the Rio, more so in the five-door hatchback than the four-door sedan. The bland bubbly shapes of the past have dissolved into a wedgy look with lots of body sculpting behind the front wheels, Kia's new signature grille in front (chromed on sedans, blacked-out on hatchbacks) with large trailing headlights and a rounded rear end. The five-door is pert and clean and interesting for the first time in the nameplate's history. And while it's tough to draw sedans on this scale, but the Rio succeeds better than just about any of its competitors. It's even better inside. The cockpit's nicely finished dash hashes together 1980s econobox chic with airplane-style toggle switches, a medium-to-large LCD screen and a soft-touch panel on most trims for a distinct look with BMW outlines and glory-days Honda finishes. There's one powertrain in all Rio sedans and hatchbacks for the 2012 model year, and it's a smooth, and pretty powerful, 1.6-liter four with direct injection and 138 horsepower, as much as the Hyundai Accent and the turbocharged Chevy Sonic. It's not as truly quick as the Sonic feels, but the Rio's combination of its four and a six-speed automatic is one of the highlights of the car. The four-cylinder's pretty well muted and the transmission shifts cleanly, without any noticeable driveline shock and with quick response that Ford's PowerShift automatic hasn't matched in our drives. Altogether, the Rio estimated EPA figures of 28/36 mpg with the automatic transmission or 29/37 mpg with the manual. Ride and handling hardly compare with the old Rio. We're still bigger fans of the Sonic's cheerful scrabble under turbo power, and the Fiesta's electric steering leads in tuning, but the Rio acquits itself better than any small Kia has, and mostly above the mean for such a short-wheelbase car with a basic strut and torsion-beam suspension. On fairly smooth roads in Texas and Nevada, the Rio rides comfortably, with little of the bounding and crashing that truly small cars used to count among their worst traits. The steering loads up on weight quickly, with the usual electric-steering lack of feedback. The feeling of continuity between those two systems is what works best, even with the slight uptick in heft in the more sporty Rio SX. Kia pitches the Rio squarely in the subcompact class, with 88 cubic feet of interior space. Cars like the Honda Fit and Hyundai Accent put more cubes on paper with their boxy rear ends, and the Nissan Versa is a bit larger. 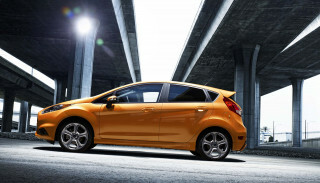 The Rio lines up best alongside the Ford Fiesta, with a 101.2-inch wheelbase, an overall hatchback length of about 160 inches, and a cargo hold measuring 15 cubic feet (13.7 in the sedan, which goes on sale late in 2011). The Rio's front seats have good, long bottom cushions and great, long seat travel, putting a good foot forward for solo drivers or pairs of adults. The back seat is more confined than in the Fit, with no adult-sized knee or head room to spare; its Accent cousin does a better job of providing space for four, and in luggage room too, where the Rio's nicely squared-off cargo hold nonetheless leaves the right kind of space for roll-on bags and Costco boxes. Safety scores aren't yet available from the IIHS or from the NHTSA. 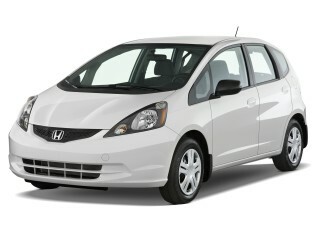 The 2012 Rio has the usual airbags, anti-lock brakes and stability control, as well as hill-start assist. A rearview camera is an option, as is Bluetooth. All Rio five-doors come with a pricetag of $14,350 including a $750 destination charge. That sticker brings standard 15-inch wheels; a manual transmission; a rear spoiler; tilt steering; split-folding rear seats; an AM/FM/CD player with satellite radio and a USB port; and steering-wheel audio controls. The automatic is a $1200 option. The $17,250 Rio EX adds air conditioning; power windows, locks and mirrors; cruise control; tilt/telescoping steering; and Bluetooth. The $18,450 Rio SX adds 17-inch wheels and sport tuning; bigger front brakes; fog lamps; power-folding heated side mirrors; and LED taillamp and headlamp accents. It also gets Kia's version of the Microsoft-powered voice controls sold by Ford as SYNC--only the Kia flavor has fewer available voice commands for phone and audio. Major options include UVO on EX models; a navigation system that replaces the UVO system on SX models; pushbutton start on the SX; and also on the SX, leather seats, a sunroof, and front seat heating. All models have Kia's five-year, 60,000-mile warranty. The Rio's another in a string of well-crafted, interestingly styled Kias. European designers draw European-looking cars, and that's true with the Rio, more so in the five-door hatchback than the four-door sedan. The bland bubbly shapes of the past have dissolved into a wedgy look with lots of body sculpting behind the front wheels, Kia's new signature grille in front (chromed on sedans, blacked-out on hatchbacks) with large trailing headlights and a rounded rear end. The five-door is pert and clean and interesting for the first time in the nameplate's history. And while it's tough to draw sedans on this scale, but the Rio succeeds better than just about any of its competitors. It's even better inside. The cockpit's nicely finished dash hashes together 1980s econobox chic with airplane-style toggle switches, a medium-to-large LCD screen and a soft-touch panel on most trims for a distinct look with BMW outlines and glory-days Honda finishes. On the economy-car scale, it's quick and light to the touch, but the Rio's performance by absolute standards is just average. Every 2012 Kia Rio has at least one thing in common: a 1.6-liter, 138-horsepower four-cylinder with direct injection and a smooth, revvy demeanor. 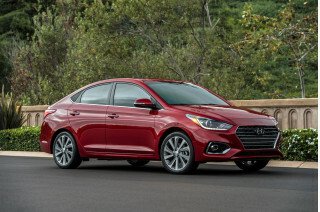 Like our favorites in the class--including the Chevy Sonic and the Rio's near-twin, the Hyundai Accent--the Rio's powerplant seems happy to go about its business, even if it takes nearly 10 seconds for it to push the subcompact to 60 mph from a stop. It's mostly muted and doesn't have much vibration associated with high engine speeds, though there's some ticking generated by the direct injection that could use a damper of its own. Kia offers a six-speed manual or six-speed automatic on the Rio. They're equally good choices, though Kia thinks only about five percent of Rio drivers will take the manual box. Minus any fancy shift paddles or exotic performance modes, the transmissions simply help the pint-sized Rio turn in excellent fuel economy numbers. Ride and handling hardly compare with the old Rio. We're still bigger fans of the Sonic's cheerful scrabble under turbo power, and the Fiesta's electric steering leads in tuning, but the Rio acquits itself better than any small Kia has, and mostly above the mean for such a short-wheelbase car with a basic strut and torsion-beam suspension. On fairly smooth roads the Rio rides comfortably, with little of the bounding and crashing that truly small cars used to count among their worst traits. The steering loads up on weight quickly, with the usual electric-steering lack of feedback. The feeling of continuity between those two systems is what works best, even with the slight uptick in heft in the more sporty Rio SX. We like the Rio's larger interior spaces and cargo area, but wouldn't mind some more seat bolstering. In raw numbers, the Rio has a 101.2-inch wheelbase, an overall length of about 160 inches, and a cargo area of 15 cubic feet (or 13.7 cubic feet, for trunked sedan models). It's significantly larger than the outgoing model. The Rio sizes up against its subcompact competitors by taking the middle of the road. 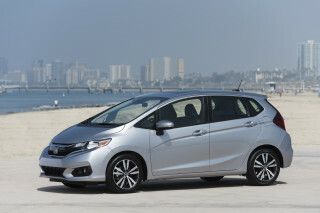 Cars like the Hyundai Accent and Honda Fit have more space inside, as does the Nissan Versa hatchback, while the Rio, at 88 cubic feet of interior room, shaves a few cubic feet to stack up against the likes of the Ford Fiesta. The Rio's front seats have good, long bottom cushions and great, long seat travel, putting a good foot forward for solo drivers or pairs of adults. Sporty SX models have more seat bolstering, and we wouldn't mind that applied to the base cars, either. The Rio's back seat is more confined than in the Fit, with no adult-sized knee or head room to spare; its Accent cousin does a better job of providing space for four. It's the same story in luggage room, too, where the Rio's nicely squared-off cargo hold nonetheless leaves the right kind of space for roll-on bags and Costco boxes. The Rio's equipped with the usual safety gear, and Bluetooth and a rearview camera are available. A brand-new vehicle built on a new platform, the Kia Rio is ahead of the game, insofar as safety scores are concerned. Neither the National Highway Traffic Safety Administration (NHTSA) nor the Insurance Institute for Highway Safety (IIHS) has crash-tested the new Rio. We'll update this rating as soon as official data is released. Otherwise, the Rio improves its protection for passengers with more standard and optional safety gear. The usual dual front, side, and curtain airbags are standard, as are anti-lock brakes and stability control, as well as hill-start assist. A rearview camera is an option--and recommended, since the five-door Rio has some notable blind spots at the rear pillars--and Bluetooth is available, and also a feature we recommend for safer driving. 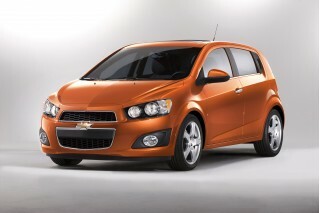 The Rio's equipment list is exceptional for a subcompact: navigation and leather are offered. The Rio is an exceptional value, considering the amount of standard equipment that's offered in the base versions. All Rio sedans and hatchbacks come with a pricetag of less $15,000 including a $750 destination charge. Standard equipment on sedans includes an AM/FM/CD player with satellite radio and a USB port; air conditioning; and satellite radio. Rio hatchbacks have a standard manual transmission; a rear spoiler; 15-inch wheels; tilt steering; split-folding rear seats; and steering-wheel audio controls. Moving up to the Rio EX five-door adds power windows, locks and mirrors; tilt/telescoping steering; cruise control; and Bluetooth. 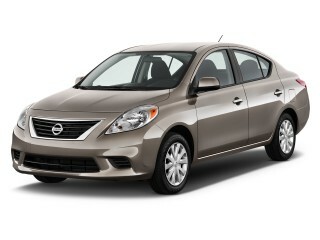 The automatic is a $1200 option on either Rio LX; the manual is only offered on LXs. Available in either body style, the Rio SX adds larger front brakes; 17-inch wheels and sport tuning; fog lamps; LED taillamp and headlamp accents; and power-folding heated side mirrors. The SX model is the only version to come standard with Kia UVO, a version of the Microsoft-powered voice controls sold by Ford as SYNC. Kia's flavor of this technology has fewer available voice commands for phone and audio. Major options include UVO on EX models; a navigation system that replaces the UVO system on SX models; pushbutton start on the SX; and also on the SX, leather seats, a sunroof, and front seat heating. All models have Kia's five-year, 60,000-mile limited warranty. Kia's experimenting with stop/start technology, but it's icing on the cake: all Rios get great EPA ratings. 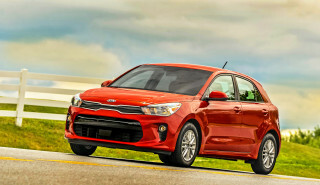 Economy cars are hitting new gas-mileage heights these days, and the Kia Rio hatchback and sedan are right there with the class leaders. The Rio comes in two body styles, and its four-cylinder engine can be paired with a six-speed manual or a six-speed automatic. Automatic versions of the Rio punch in at 28 mpg city, 36 highway, while manual versions get 29/37 mpg. A word about why smaller cars score lower here than slightly larger cars. In a word, aerodynamics. Light weight and small-displacement engines go a long way toward producing good fuel economy, but ultimately, a car's shape and size plays a role. The Rio's just too short and upright to generate the smooth shape it needs to cut wind resistance to Elantra-like level--and as a result, its gas mileage is roughly equal to that of its compact-car cousin. 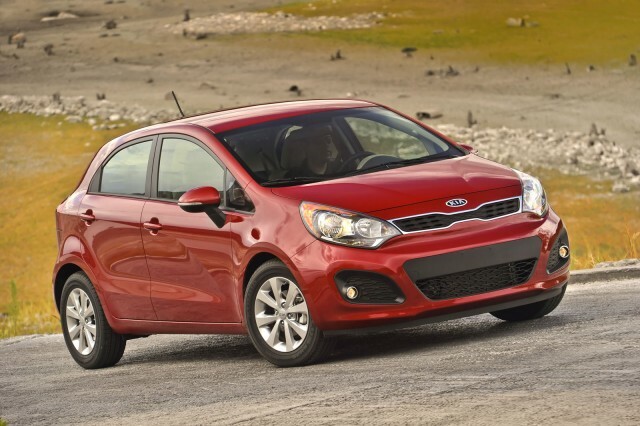 The 2012-2013 Kia Rio is one of a set of vehicles found to have overstated fuel-economy numbers. Kia initially submitted figures of 30/40 mpg and 33 mpg combined (34-mpg combined with the manual) to the EPA, which allows automakers to self-certify fuel economy. On a confirmation check of several vehicles, the EPA found the Rio's actual tested fuel economy to be 28/36 mpg (31 combined) with the automatic transmission or 29/37 (32 combined) with the manual transmission. The 2013 Rio Eco model was also downgraded, from an original 31/40 mpg (34 combined) to 30/36 mpg (32 combined). Owners can register with Kia to receive reimbursement for the gas consumed above and beyond expected levels; more details are found at KiaMPGInfo.com. 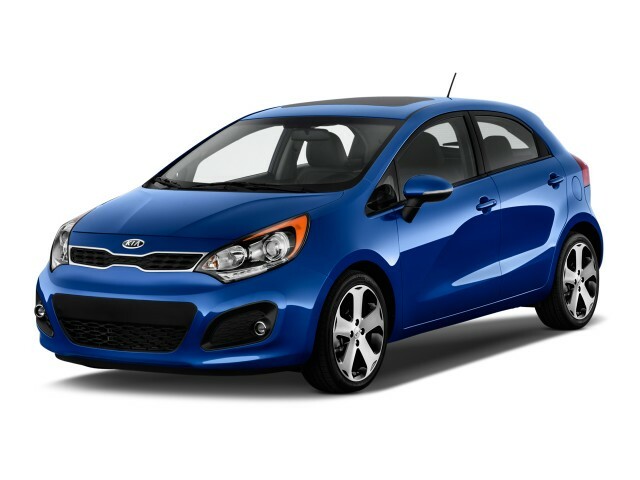 Looking for a different year of the Kia Rio?